To optimize the breaker plate design for maximum number of holes of different sizes while maintaining the stress values within the permissible range. For given sizes of holes, the parametric model was developed using ANSYS CAD tool to identify maximum number of holes that can be drilled on the breaker plate. A followed stress analysis was performed to evaluate the deformation values for the breaker plates of different sizes of holes. Breaker plates are essentially required in extruders to cover filter screens, and provide uniform melting and mixing of the polymer before entering the die. The number of holes in breaker plates has a direct impact on the time required for the forming process. A leading extrusion machine manufacturer approached Hi-Tech to re-engineer the breaker plate, by increasing the number of holes of different sizes for a given design space. 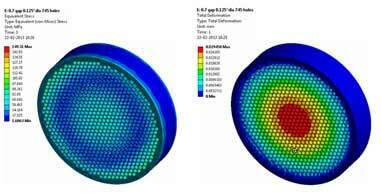 The customer also needed to analyze the optimized breaker plate design for stress distribution and subsequent deformation. 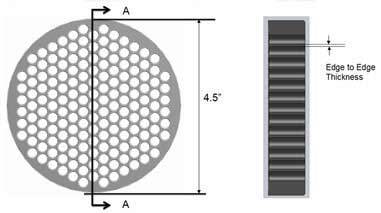 Hi-Tech’s engineering team developed optimized breaker plate design with maximized number of holes of different sizes. Providing three different hole configurations for a given break plate geometry, the optimized design was also evaluated for stress distribution and deformation. The edge to edge thickness between the successive holes was also crucial, to avoid excessive deformation due to stress generation. With consecutive iterations considering the different parameters, three optimized breaker plate designs were proposed possessing maximum number of holes as well as maintaining the stress and deformation values within the allowable limits. Hi-Tech CAE is a division of Hi-Tech Outsourcing Services, a pioneer engineering outsourcing company since 1992 based in India & USA. It provides expert Computer Aided Engineering – CAE consulting services for engineering / product design analysis by modeling & simulation. The primary services extended include Computational Fluid Dynamics (CFD), Finite Element Analysis (FEA), product design optimization and value engineering services to Automotive, Building / Construction, Process industry, Power Generation, Manufacturing & Heavy Engineering industries..